The United States Congress designated the Agua Tibia Wilderness (map) in 1975 and it now has a total of 17,975 acres. 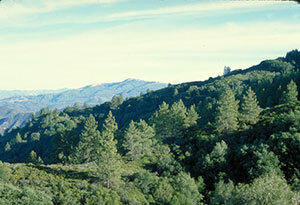 All of this wilderness is located in California and is managed by the Bureau of Land Management and the Forest Service. The steep, chaparral-covered mountains of Agua Tibia Wilderness give way to stands of fir, pine, and oak at higher elevations that rise above 4,400 feet on Agua Tibia Mountain. Elevation ranges from 1,700 feet in the canyon bottoms to the 5,077 foot Eagle Crag Peak. Untouched by wildfire for what may be more than a century, some of the dense stands of chaparral have manzanita and red shank reaching higher than 20 feet. Although light snow may fall in winter and rain from January to April (usually averaging 25 inches annually), summer temperatures often exceed 100 degrees Fahrenheit and water may be hard to find. Temperatures tend to be a more moderate 80-90 degrees at upper elevations. The Dripping Springs Trail (about 6.8 miles long), part of approximately 25 miles of pathways, receives light human use and provides the main access to the area. The trail crosses boulder-strewn Arroyo Seco Creek and climbs Agua Tibia Mountain with splendid views of the mountains of southern California. From the crest of the mountain, the Palomar-McGee Trail (about 5.5 miles) enters a forest, descends to Crosley Saddle, and continues south near Eagle Crag before branching off into the Wilderness. The western portion of the Wilderness is dry and seldom seen. In 2007 the Poomacha fire burned approximately 1,500 acres in the Agua Tibia Wilderness. Efforts continue to rehabilitate the burn area. Planning to Visit the Agua Tibia Wilderness? How to follow the seven standard Leave No Trace principles differs in different parts of the country (desert vs. Rocky Mountains). Click on any of the principles listed below to learn more about how they apply in the Agua Tibia Wilderness.